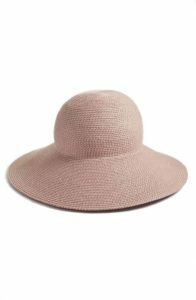 It can sometimes be challenging to find a quality women’s sun hat to protect your face and neck that looks good and is fashionable. The most popular styles come in everything from beautiful fedoras to floppy, wide-brimmed designs in a rainbow of color options. So not only will you look amazing, but it is easy to get the best protection from the sun with UPF rated options in lightweight, breathable fabrics. 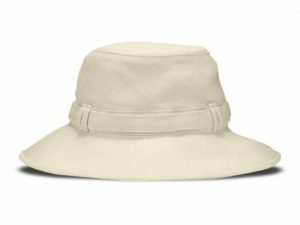 Whether you need a design for hiking, a beach style, or something packable for travel, we have got you covered (up) with a list of some of the best hats to protect your skin from UV rays and sun damage. The Brixton ‘Joanna’ is a stylish design women love for travel or for wearing to the beach or the pool. 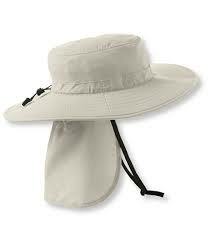 It has a wide brim which will cover your face from the sun. The entire design is a little stiff, so you have to be careful when packing this hat, it should be packed flat, and the crown should be filled with other clothing items to help it keep its shape. It will provide the right amount of shade without feeling too big. It comes in different head sizes, so you have to measure your head to ensure you are getting the correct fit. This popular design from Scala is a fantastic choice to help protect you from the sun. It is so versatile you can wear it for a lot of different outdoor activities like going to the beach, gardening, and hiking. It also works well for traveling since you can pack and fold it up, and it will still look great when you pull it out. This design will keep your head fresh and keep the sun off your face, neck, and shoulders. It comes in 35 colors and works well for head sizes up to about 22 inches circumference (see below for info on how to measure your head size). The brim size is 2.5 inches, which is on the shorter side for protection (I usually like at least a 3-inch brim), but it is slanted downwards and can be shaped and styled so you can get the maximum protection. The fabric is relatively heavyweight cotton with a UPF 50+ rating. The interior has a tie string in the sweatband to allow you to tighten it if you are finding it is too big. This design is easy to take care of as it holds up well to hand washing or washing on a delicate cycle in your machine. When the hat is air drying all you need to do is work it back into its original shape. If you are going on a cruise, or somewhere you may encounter a lot of wind, this style isn’t the best option as it does not have a chin strap. If you are looking for a colorful, stylish straw hat, the Wallaroo Women’s Victoria Poly-Straw Hat is well worth a look. 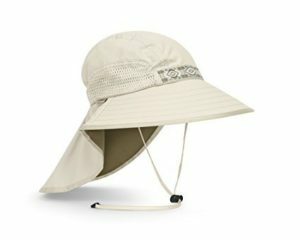 It has a 3.5″ shaped brim so that you will get plenty of cover from the sun. It also has an internal drawstring, so you have room to adjust the sizing if it is a little big for you. It comes in 19 beautiful colors, so you will likely find a color to match any outfit. It would make an excellent style for traveling since it is packable and lightweight. The only caveat is you have to pack it flat or by filling the crown with something like socks or other clothes to maintain the shape of the hat. It can be hand washed in cold water, but if you look after it, it probably won’t need much cleaning. The Victoria has a 22 ⅝ inch circumference size, so it will work for those with larger sized heads. If your head is a smaller size, Wallaroo also has a petite version you can find here. 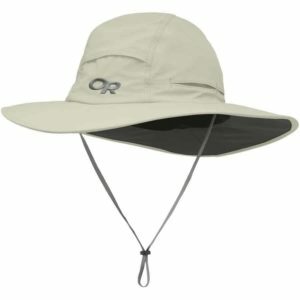 Outdoor Research has a lot of great options to choose from, one of their most popular styles is the Sombriolet Sun Hat. It is similar to the Columbia Booney listed above as it has the nylon and polyester with UPF 50+, the moisture-wicking headband and a drawcord to customize the fit. One difference from the Columbia is the brim is a little wider so you will get a bit more coverage with this style. What is great about this style is it works well not just in the sun but also in the wind and the rain. This style is made of a light-weight material, with nicely placed vents to allow air in, and heat out. The brim has a foam insert, so it will float if you drop it in the water. 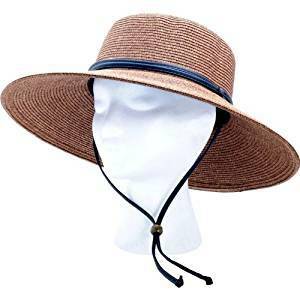 A popular style a lot of women like for gardening is the Sloggers Women’s Wide Brim Braided Sun Hat. Not only will this Slogger style protect your face and neck because of the wide 4.15-inch brim, but it also has a wind lanyard so you can wear it when it is windy. It has an elegant modern design that you can wear on a cruise, to the beach or with a beautiful dress at a garden party. The material is 65 % paper and 35% polyester, making it feel solid and durable while at the same time being soft and providing a UPF 50 rating. The lanyard is a soft material with a bead you can adjust up and down. This design is 22.5 inches, so it won’t fit if your head is larger than that in circumference. This style probably isn’t the best option for traveling since it doesn’t pack easily. It is packable, but you will have to take precautions to ensure it doesn’t get crushed in your luggage. One issue some women have run into with this style is it can get a little hot, as there are no vent holes in the top for cooling. Booney hats are a well-loved style for fishing, hiking and for going to the beach. The Bora Bora Booney II from Columbia is a favorite style for many because it offers excellent protection for your face, neck, and ears with its UPF 50 fabrication. This style runs a little big so it is good for those who have a big head or thick hair. It is also unisex, so you need to be careful with sizing. Most people find Bora Bora Booney II to be comfortable and breathable because of the fabric, and the ventilation allows an adequate amount of air flow, so your head doesn’t get too hot. It comes with a drawstring to keep it secured in the wind, as well as a string to adjust the fit if the sizing is too big or too small. One other feature to note is it has an Omni-Wick® sweatband to keep you cool and the sweat from dripping in your eyes. 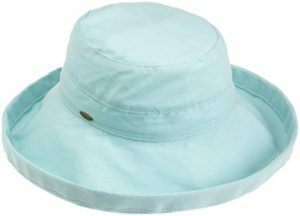 The L.L.Bean Tropicwear Outback Hat is a lightweight enough to help keep you cool and comfortable in hot weather. The fabric is a quick-drying nylon/polyester blend with a UPF 50+. Like most of L.L Beans products, this is a well made, durable option with lots of great features. It has a moisture wicking sweatband to stop sweat from dripping onto your face. It is another design with a foam insert to ensure the hat will float if you drop it in the water. If you like to have extra protection for your neck this is a great option, as it has the back flap you can roll out if you need it or tuck it into a hidden pocket if you don’t. It also has a chin strap and an adjustable head strap, that is helpful if you are in windy conditions. The only downside to this design is it doesn’t have much ventilation, and it may get hot in the sun. 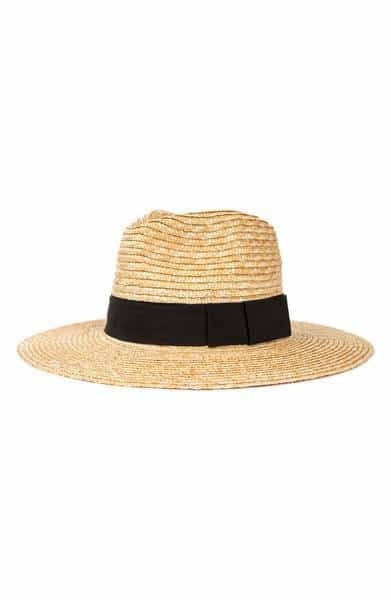 The Eric Javits Hampton’ Straw Sun Hat is the most expensive on our list, but it is very popular as one of the best designer options. It is reportedly very comfortable, well made and good for traveling. This fashionable, yet practical, design makes it versatile enough to wear almost anywhere. It only comes in the ‘one size fits most’ option so that it may be a little small for some women. The brim is 4.5 inches, which should provide significant coverage from the sun for most women. It isn’t the largest beach style, but rather a more subtle and practical option you can wear for most activities. It does come with an inner adjustable tie so you can tighten it on windy days. If you can get past the high price tag, a lot of women feel this brand is well worth the cost due to the quality, style, and versatility of the hat. 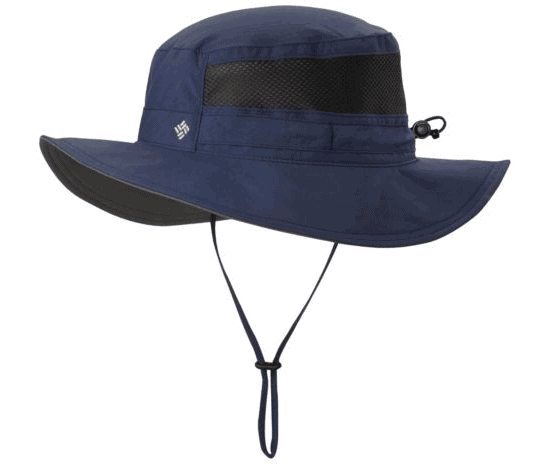 The Sunday Afternoons Adventure Hat is one of the most beloved and well-known sun styles you are going to find. It has excellent protection with its 4″ brim and 7½” neck cape. The Nylon Polyester blend fabric is UPF 50+ so that you will be getting a lot of protection from the sun. It’s a little dorky looking, but people love this style for the protection it offers and how good it is in different weather conditions. When it is hot it has ventilation and a wicking sweatband, so you don’t get drenched in sweat. When it is windy and raining, there is the neck lanyard to keep it on, and the fabric is water-resistant to help keep your head dry. 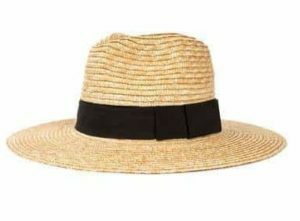 Tilley Hats are another much-loved option if you are looking for a good quality, long-lasting style to keep the sun off. The Tilley Women’s Hemp Cloche Hat is a beautiful design that is elegant but will also protect your face. It has a 3-inch brim and comes with a wind cord. It has a secret pocket you can hide your money and credit cards, or you can tuck the wind cord in if you aren’t using it. It is a fabulous design for adventure and travel as it’s water resistant and easy to clean, you can fold it up, pack it, and it will still look great when you take it out. When buying a hat, it is essential you measure your head circumference, especially if you are ordering online. A rough sizing guide is if your head circumference is 20″ – 21″ it will be a medium size, 21″ – 23″ will be a large size, and 23″ – 25″ will be extra-large. To measure your head, use either a measuring tape, a piece of string or dental floss and place it around the crown of your head above the eyebrows and ears (the largest part of your head). Try not to hold it too tight or too loose. Then check the measurement or measure the length of the string. Most hats will say the circumference in the description of the product. Some models have adjustable sizing using an inner adjustable head strap that you tighten or loosen depending on your preference. If your measurement comes up in between sizes, go for the larger size, and look for a style with an adjustable sizing strap. For good sun protection, you will want to look for hats which have a brim with a minimum of 2.5 inches, but a 3-inch rim is an excellent place to start. You can get much larger brims that go into 4.5 inches or more, but there are some downsides to getting a style with a huge rim. While they will give you excellent protection, they can be a bit distracting and make it challenging to see. You will also want to consider the angle of the brim. Brims that are angled downwards will give you a little more protection than those that go straight out from the crown. If you are looking to protect your skin from the sun you should make sure you know how much protection you are getting. It is a good idea to get a design with a UPF (Ultraviolet Protection Factor) rating of at least 50+. The UPF rating measures how much UV radiation is going through the fabric. A fabric with a UV radiation of 50+ should block at least 98% of the harmful UVA and UVB rays. FYI not all of the hats we listed above have been measured for their UPF rating. 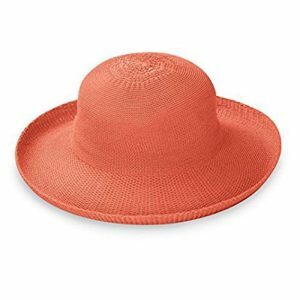 Most people are going to be wearing their sun hats while they are traveling, so it’s a good idea to look for hats that will it retain their shape when they are packed in a suitcase. Most hats will get a bit wrinkled when packed, but if the product is described as being packable, the wrinkles should be able to be smoothed out once the hat is outside of the suitcase. One annoying problem with larger brimmed hats is they love to blow off in the wind. The obvious solution to this problem is to get a design with a chin/neck strap. It will stop it from blowing off, and when not in use most straps can be tucked away into the hat. Depending on when and where you are wearing them, sun hats can get pretty dirty or stained with sweat, which is never a good look. If your caps tend to get dirty quickly, look for fabrics which can be hand washed or washed on the delicate cycle in your machine. You will probably want to avoid straw designs. Generally, when you clean a hat, you will air dry it and then take some time to shape it into the proper shape while it is drying. A critical factor in finding a great sun hat is how breathable it feels on a hot day. If the fabric is breathable, you will have a better chance of staying cool and not overheating when the weather gets hot. If you are doing a lot of physical activities, you will also want to look for styles with mesh ventilation. Comfort is another crucial factor in getting a good hat. Sizing and fabric are essential to get a comfortable fit, but you should also think about the activities you are going to be doing while wearing your hat and choose a brim width and style accordingly. 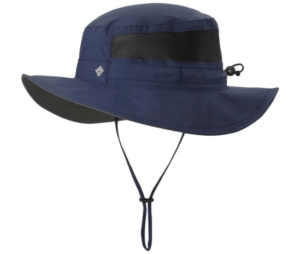 A sizeable brimmed design might be great for the beach won’t be very practical when trying to see your way on a trail when hiking. Or if you are looking for something for activities with a lot of wind, you will need to get a hat with a chin strap. If you have ever worn black fabric in the summer, you will know it doesn’t tend to do an excellent job at keeping you cool. The most popular styles are light-colored. Light colored fabrics help reflect heat rather than absorb it as dark-colored fabrics do. Lighter colors get dirty faster, while dark colors may fade quicker than lighter colors. The most useful sun protection hats don’t tend to the most fashionable. It can be challenging to get something you feel comfortable in that also protects your skin. A weird design or a huge floppy style can make a lot of people self-conscious, no matter how much protection they are getting from the sun. Look for styles that suit your face or at least you can live with when wearing out in public.